Being the hottest fashion event in Mumbai, it’s only natural that the style quotient at Lakme Fashion Week is through the roof. We’ve studied the lineup of divine looks with a fine toothcomb to find out what’s in store for you this season. Take a look at the 4 trends you’re about to see everywhere you look this fall and winter. What could take everyday prints a notch higher? Doubling and sometimes, tripling them. Mixing prints on prints might seem manic but presents a certain busy beauty when done well. Take a note from the runway and bring out your printed garb this season. Matte may be hot but that’s only in makeup. Currently, fashion is experiencing a peak in fabrics like textiles, weaves and silk that are high in shine and gloss. It’s a novel look that adds a certain depth to the ensemble that it’s part of. Plus, it couldn’t be easier to add to an everyday outfit. Of course pantsuits made the list of hot fashion trends for the season ahead. They’ve been spotted all over the globe this year and aren’t going anywhere. 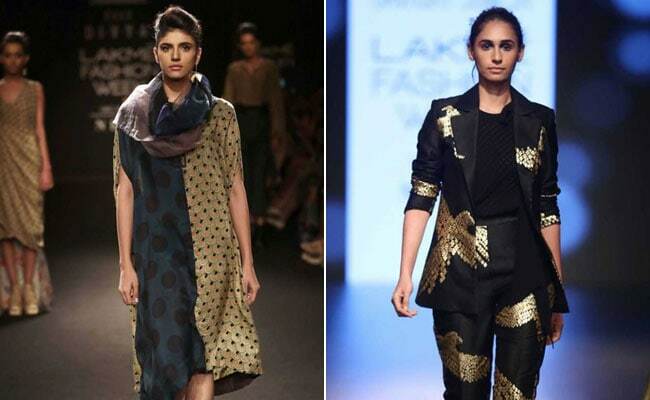 Expect to see many more pantsuits with motifs and prints taking centre stage across them. Winter may be coming but in cities like Mumbai where the temperature doesn’t hit single digits, light layering is ideal. It doesn’t feel stuffy and adds an additional piece to experiment with. Now go ahead and make note of these for the season ahead.